I bought 2 metres of this Navy & White striped ponte roma from Minerva Crafts sometime ago. It had been washed and was waiting (patiently!) in the ‘Roundtuit’ pile. 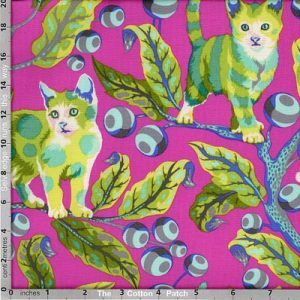 As Summer is fast coming to an end and I was going to change the thread colour on my overlocker I wanted to get this fabric made up so that it did not end up in the stash waiting for next year! Originally I had planned to make a ‘Coco’ by Tilly and the Buttons but could not find my copy of the pattern, and as usual, having decided I wanted to make up the dress, could not wait to search through the various stashes of dressmaking patterns that are located around the house (and in store in the garage!). I have a subscription to Seamwork and noticed that there was a plain-style shift dress, the NEENAH. I could adapt the design to a scoop neckline, I printed off the pdf so I could get stitching (almost) immediately. From weather to clothing to lifestyle, fall is all about transitions. 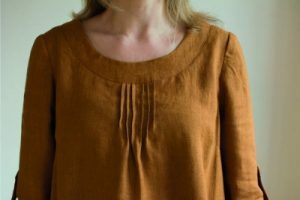 Finding a garment to transition you through fall and winter, day and night, can be tricky. Neenah will do all that and more. It is a classic turtle neck dress, appropriate for both the office and nightlife. And because Neenah is a knit dress, it is both classy and comfortable. Use a solid-coloured, merino wool knit to create a sleek look, or try a fun print for a dress with more flare. If you shorten the hem of Neenah to tunic length, it pairs well with a variety of skirts. Neenah is a staple garment that will expand your winter wardrobe. During the colder seasons of the year I often wear a turtleneck (I call them Polo neck), if the Neenah worked well in this iteration it would be ideal for making in its original style for Autumn and Winter. 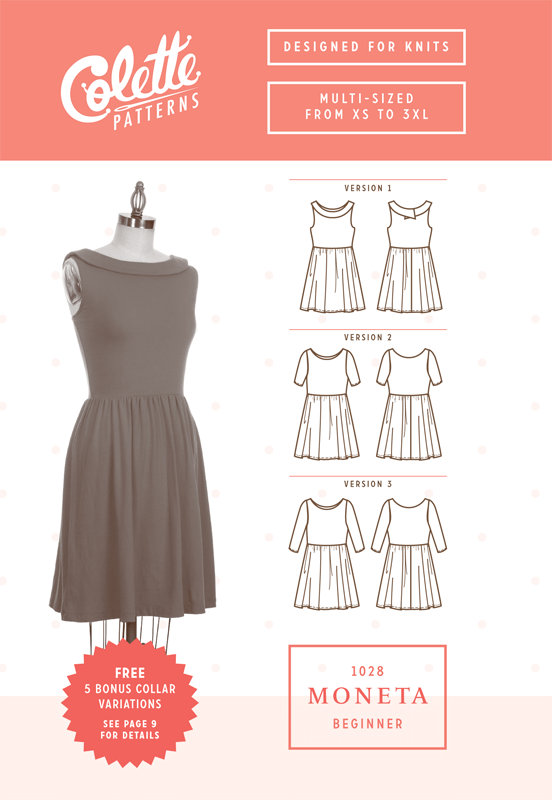 I drafted the scoop neckline freehand and laid out the copies of the pattern pieces. According to the body and garment measurements I should cut a 3X and this is what I did. The only changes to the pattern were to cut 4 inches off the length of the dress so that it should hit just below my knees – at the narrowest point of my calves and shorten the sleeves to 3/4 length. However, at first fitting I found the dress was much too big and had to take in at the side seams by a total of 4 inches. There was not much I could do about the chest width and shoulders (I hate having to alter half-made garments) but the dress is still wearable and I have adjusted the pattern ready for next time. I used my usual method for the neck band and a standard twin needle for stitching the hems on the sleeves and dress. In the illustration of the pattern the dress looks to be a lot closer fitting and to achieve this I will have to add some body darts for shaping at the back. The fullness of the dress may be due to the stretch and weight of the fabric or just the fact that the dress is over-sized for me (does not happen very often!). 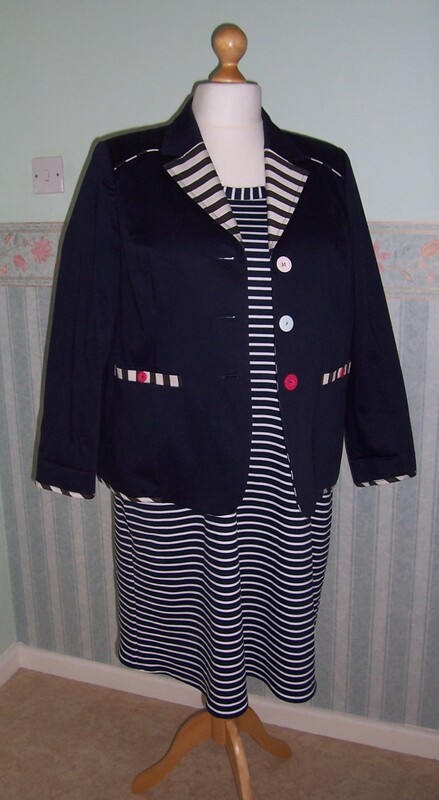 The dress can look casual worn on its own or be ‘dressed up’ with a co-ordinating blazer from Joe Brown that I purchased last year. 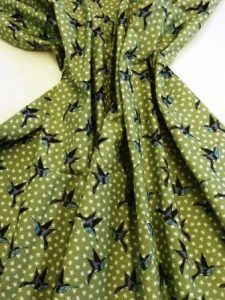 Now it is time to change the thread on the overlocker and get on with darker-background patterned fabrics ready for Autumn and Winter. In my wardrobe I have a dress that was bought from M&S many years (approximately 20+)ago. One day I suffered a mishap with some bleach which unfortunately caught the skirt of the dress and has disfigured it so much that it can only be worn indoors as a ‘housework’ dress. I have regularly searched on auction sites to see if I could find a replacement but to no avail. 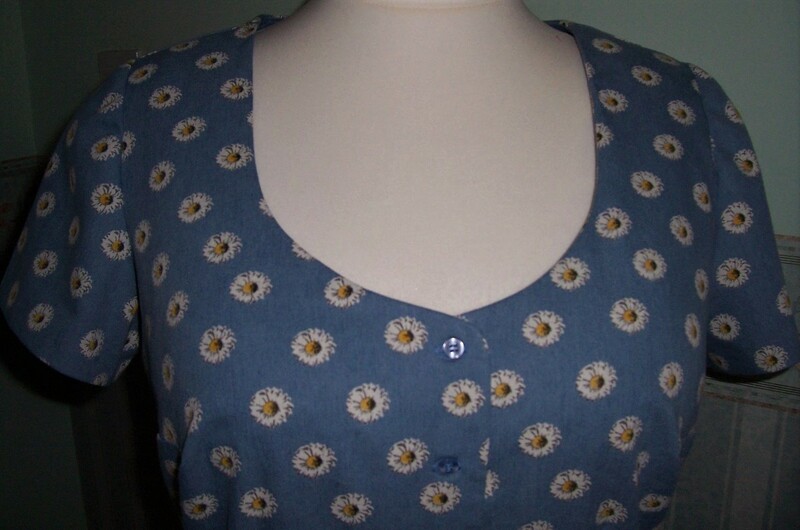 Using the basic design of the dress as inspiration, I have made a replacement using some daisy-printed lightweight denim from my stash. I had already laundered the fabric and was good to go. Using my basic bodice block (similar to the Kitty shirtwaister dress) I drafted a scoop neckline and matching front neck facing. 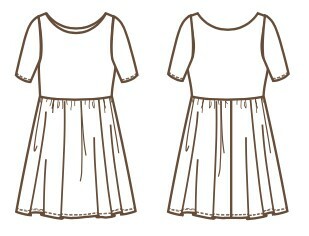 The dress would be button-through the bodice and the skirt. There would be short capped sleeves for which I would use my TNT sleeve pattern – that you have seen many times before. The fabric was approximately 2.5 metres in length x 150 cms wide as I believe I originally intended to make a wraparound skirt. I would have to be careful with the layout of pattern pieces to ensure that I had sufficient to make the skirt in the length I desired. Cutting out: I had only sufficient fabric for the 29 inch length of skirt inclusive of hem and due to the weight of the fabric (and lack of yardage) was unable to cut the sleeves with a self-fabric lining. Also there was not enough fabric to make ‘in-seam’ pockets. I did have some cotton lawn in a Pale Blue with White polka dots so decided to use this for a single patch pocket lining and make some bias binding for the sleeve hems. Construction: Was fairly plain sailing. I made up the patch pocket but in the end as I had only one decided against it as this would make the skirt appear ‘clumsy’. Decisions: What buttons to use? Tortoiseshell Buttons or Lemon Yellow? This conundrum occupied me for an evening as apart from the hem of the skirt buttonholes and buttons were the final details to be completed. I tried tortoiseshell and also a contrast in Yellow. Finally by raiding a jar of Blue buttons I settled on some co-ordinating Blue buttons that measure only 1 cm diameter and therefore to do not ‘shout’ at you and as there are 15 buttons this is a good thing to! Once the buttonholes and buttons had been applied the hem was turned up and hand stitched. The neckline is possibly a little too scooped for my liking but still wearable. I have adjusted for the next make – there will certainly be one. 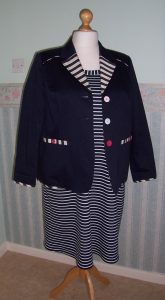 I am pleased with the make and now the original M&S dress can be ‘retired’. I may recycle the buttons from that dress along with the fabric for another project. As promised in the previous post, I set aside my original plans for August in order that I could test-sew the Helena dress and pass on my findings to Lizzie before she attempts her version. Helena is a relaxed easy to wear dress. The front curved yoke anchors the pintuck detail at the centre front. 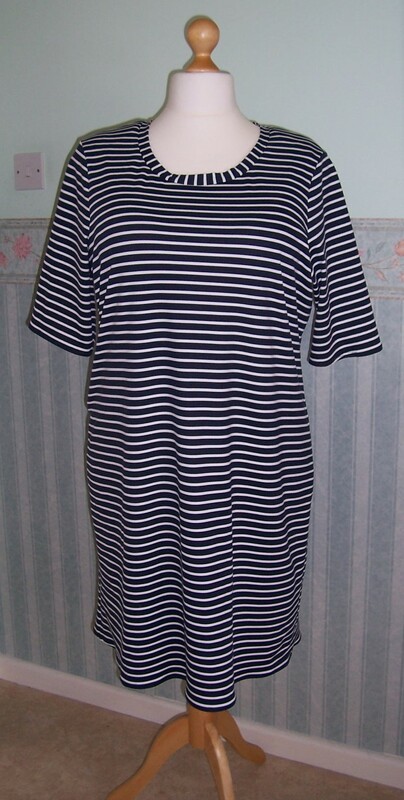 The elbow length sleeves are held in place with a simple button and tab. There are side pockets which are a must and keep the lines of the dress clean and simple. First thing was to prepare the fabric. As this is cotton and I am dressmaking I didn’t want the finished garment to shrink. As I have an overlocker, I always run the raw ends through the overlocker and this way the fabric will stay neat and stable whilst going through the wash. It also means that even if I don’t use a fabric immediately, it will be ready to cut and stitch. So, a quick run through the washing machine, dry and press ready for laying out the pattern. When pressing the fabric I am also be able to see whether the fabric has been cut ‘on grain’. I found that my length had been cut at an angle so when laying out the pattern I will have to make sure that it does not run off the ends. In the instructions it says ‘measure twice – cut once’. In addition to that I would say ‘be aware of the amount of ease in a pattern’. Personally I know that I often have to do an FBA (Full bust adjustment). I therefore checked the finished garment dimensions and although according to the size chart I should have cut a 22, decided to go for a 20 which has a finished bust of 58 and 5/8ths. This will be more than ample across bust and hips whilst being sufficiently narrow across the shoulders which is where I want a really good fit. Before I cut out the pattern there were just a couple of checks on the sleeves. Firstly to check the length, I have short arms but as these have a tab and button fastening for rolling up, then for now it won’t matter if they are too long. Secondly, the width of the sleeve across the bicep. I measured around the fullest part of my arm and then compared with the width of the sleeve at the underarm point. There should be around 2 inches of ease. All was OK so I went ahead and cut out. I adapted the layout of the pattern pieces and by putting the back piece parallel to the selvedges and nesting with the front I used just over 2 yards of fabric. I have just about 1 yard left of the 60 inch wide fabric – sufficient for a sleeveless top! I marked all the notches with little snips into the seam allowance, doing the same with the dots. I cut tiny triangle shapes at the centre front of the main body and front yoke pieces. Also centre back of the two back yoke pieces. I applied Vilene F220 medium weight fusible interfacing to both front yoke pieces and also to two button tabs that will be used when rolling up the sleeves. I checked a couple of things on the sewing machine BEFORE I put the pedal to the metal! What size needle was in the machine? Had it been used for more than 6-8 hours of sewing? If so, it needs to be replaced. What thread am I using? I did a test stitch on a scrap of the fabric to check tension and stitch size. On the main front piece, I marked the pin tucks and bust darts with a Clover chalk marker. Stitched the bust dart from the outside edge towards the point. Pressed downwards over a ham to increase the shaping. I Stay- stitched the neck edge from each shoulder towards the centre front. When stitching the tucks – from the right side, I started with the ones on the far right of the bodice. In this way I did not get ‘fouled’ up with the pins in the other tucks. Once the tucks were stitched with the contrast thread and pressed away from the centre front, I then re-stitched across them at the neckline edge. Next came the slightly more complicated procedure of attaching the front yoke. This is a ‘sad’ curve that needs to be attached to a ‘happy’ curve. But with the stay-stitching on the main front acting as a guide I pinned carefully around the shape. Once stitched, I used a contrast thread to triple top-stitch around the outer edge of the front yoke. I neatened the raw edge of the front neck facing with my overlocker and then attached to the inner curve of the front neck before securing by stitching in the ditch from the right side. I attached the back yoke and back yoke facing by sandwiching the main back pieces in between. I flipped the facing out of the way (so that there were not too many layers of fabric) whilst I top-stitched in the contrast thread. I checked the placement of the pocket bags and moved them up by 2 inches. I would rather have them too high than so low that I could only reach them by pulling up my skirt! The side seams of the front and back were stitched, incorporating the pocket bags and then neatened with the overlocker. Now came the most difficult part of construction. This was a new method for me and although the final result was good, I would rather have completed it in my ‘old-fashioned’ method. The recommended procedure involved a lot of tussle with the fabric of the back and front, not to mention pocket bags. The sewing level on the pattern envelope states ‘beginner plus’ but by following the recommended method I think it puts the ability and experience level up to intermediate. 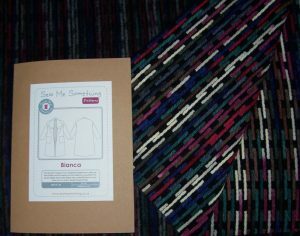 The sleeve tabs (which are referred to as plackets in the instructions!) 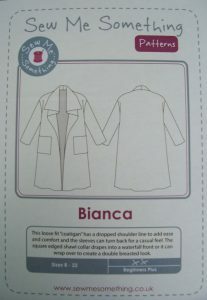 are straightforward and by attaching them (plus the buttons) when the sleeves are flat, makes it an easy operation. 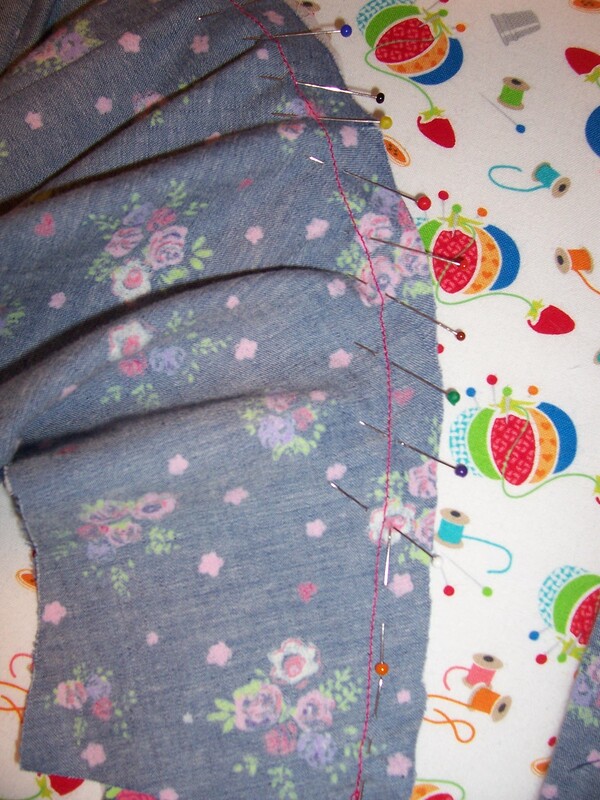 Easing of the sleeve head into the armscye was also very easy – in this area Helena is a well-drafted pattern. Finishing off with double-fold machine-stitched hems to the sleeves and the front & back meant that the garment was quickly completed. 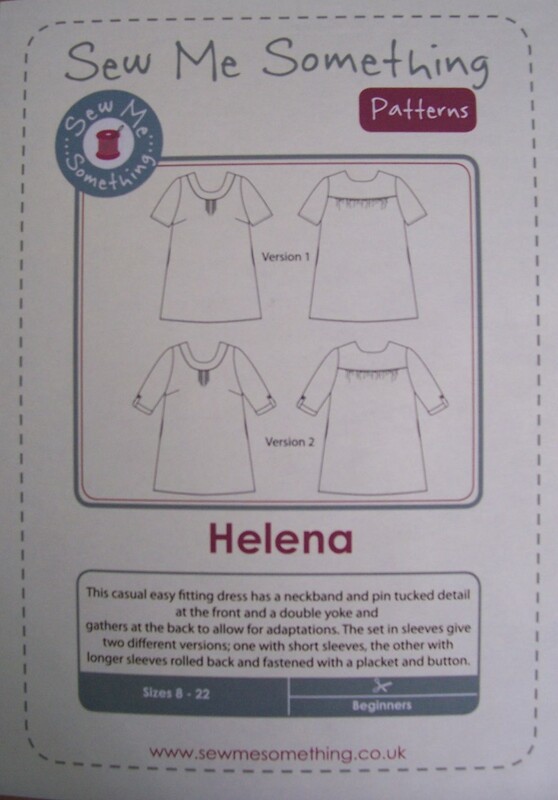 In conclusion, I will be making Helena again but will reduce the fullness considerably if to be worn as a day dress. If made as a nightdress the fullness would be comfortable. 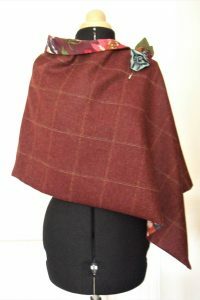 There is plenty of scope for adaptations; finishes to the yoke, changing tucks and gathers to unpressed pleats, changing the length of the sleeves,adding trim and fabric/pattern blocking. Bright-eyed and bushy-tailed at 8am a group of forty-plus ladies gathered together in a car park on the outskirts of Andover, all excited at the prospect of visiting the Festival of Quilts at the NEC, Birmingham. I have visited the NEC many times before but never before visited the FOQ so this would be a first for me. I had a list, my packed lunch, spare shoes and a camera plus of course, cash and credit cards! The journey was completed in good time and we were dropped off at the door of the main entrance. A short walk and we arrived at the three exhibition halls for the event. Between our ‘sub-group’ of 5, we agreed to meet again at 1am for lunch and to discuss progress (and purchases!). I teamed up with Lizzie who is also a ‘newbie’ for FOQ. Where to start? We decided to approach the halls in a systematic manner by following a route up and down the various aisles of traders – to be followed by a tour of all the fabulous quilts. Well, what can I say? Next year we will be visiting for TWO days. One is simply not enough. The plan should be to spend on day 1, and view on day 2 – it really is not possible to see everything in one day. Lizzie had a pattern for a ‘poncho’ style cape and was looking for some wool tweed or boiled wool to make up the pattern. First port of call was the Rosenberg stall. We were reminded that washing boiled wool is a ‘no-no’ as it will shrink! Better to find some tweed – which will still have to be dry-cleaned but my not show quite so grubby quite so quickly. On the same aisle we came across the ‘Sew me Something’ stand where, would you believe it, Lizzie’s pattern was displayed. After an animated discussion with the ladies on the stand Lizzie and I ‘invested’ in some dressmaking patterns. 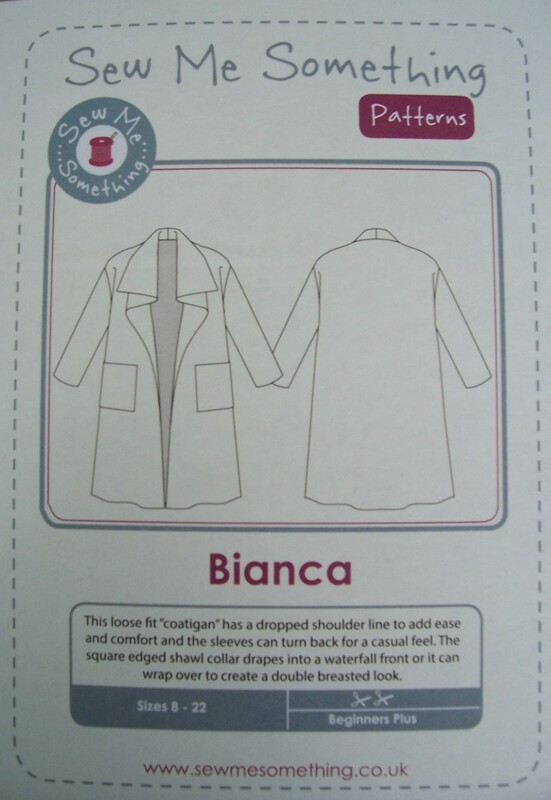 Lizzie bought the Helena dress pattern and I bought the Bianca coat and Helena dress patterns. 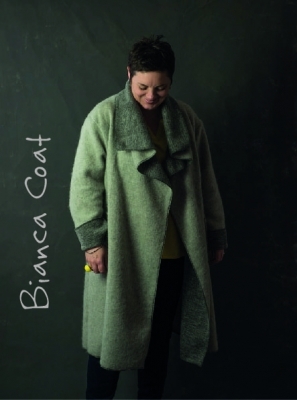 Our Bianca Coat is deceptively simple to make yet stylish and works in both heavy woven and knit fabrics. 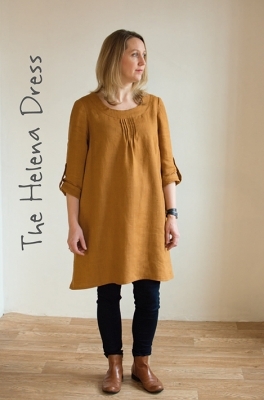 Helena is a relaxed easy to wear dress. The front curved yoke anchors the pintuck detail at the centre front, but this could easily be changed to pleats or gathers. 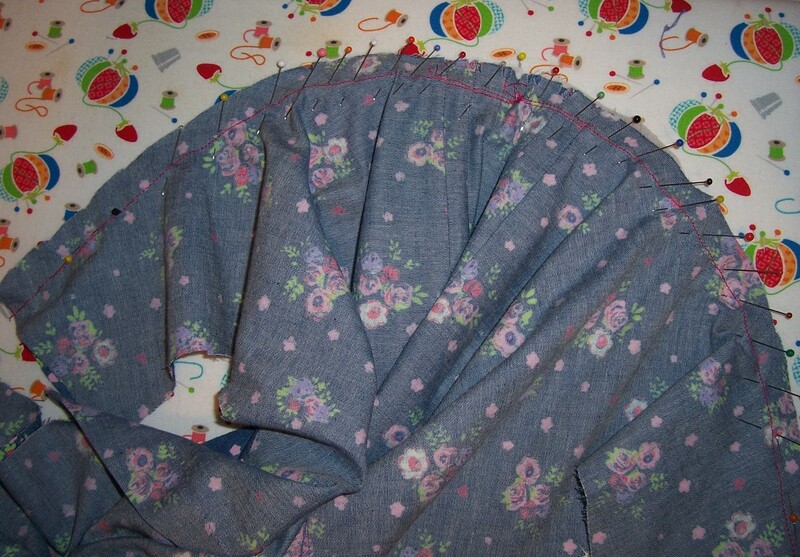 The back yoke also lends itself to adaptations with the gathers changed to pleats as well. The elbow length sleeves in view 1 can be extended into the 3/4 length sleeves in view 2. And the simple button and placket hold the turned up sleeves in place. Side pockets are a must and keep the lines of the dress clean and simple. Now we were ‘armed and dangerous’ in our search for appropriate fabrics. After a thorough investigation of all the traders’ stands we ended up with everything that we required, with the exception of a Pineapple Log Cabin ruler that Lizzie was seeking – she will however be able to order this online – probably on Sunday! I purchased some fabulous wool mix fabric for my Bianca coat from Rosenberg’s. 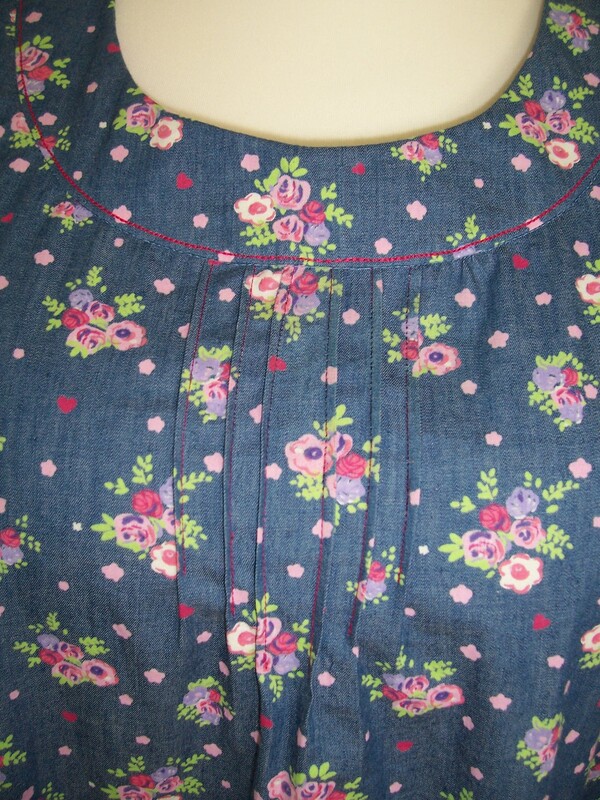 Both Lizzie and I bought some pretty floral print chambray for our Helena dresses. 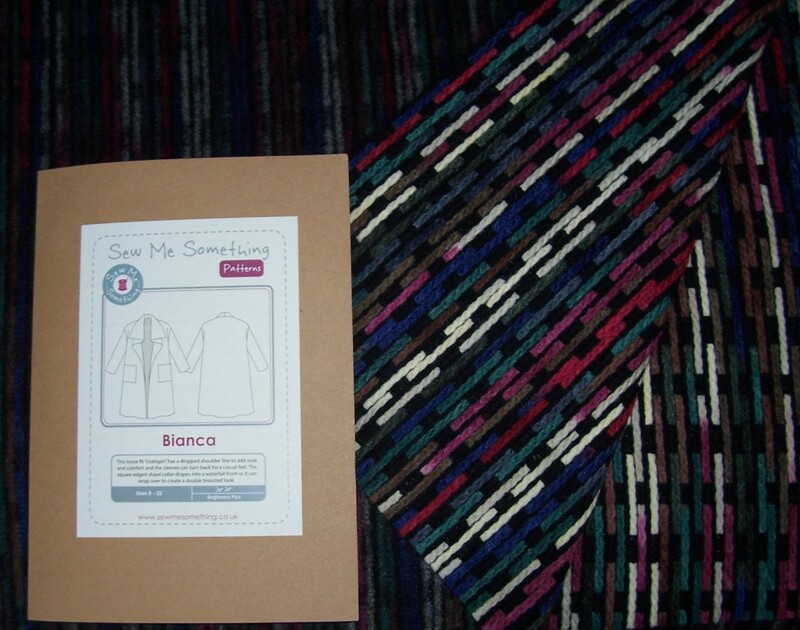 I bought a pack of lovely Calico from Lady Sew & Sew and Lizzie acquired some great Grey Pure Wool Tweed for her poncho which will be lined with some terrific Tula Pink cat print cotton. Tula Pink fabric for lining – I must have some of this! During our 2 plus miles walk around the halls we viewed many quilts (and patchwork chairs! ), checked out sewing room chairs, sewing machines and overlockers, met several famous names from the Patchwork & Quilting world and had a thoroughly enjoyable and inspiring time. We dropped in on Janet at Quilters’ Dream and Meg’s stand of New Threads was really buzzing! In addition to this first visit to FOQ, I also made my first ever visit to Wetherspoons where we enjoyed our lunch! By 5pm all the ladies were gathered outside in the sunshine as we waited to be collected by our coach and driver. The return home was accomplished in just over two hours and I noticed that although there was a lot of chatter, it was all more subdued as we returned home, tired and happy. A grand day out! 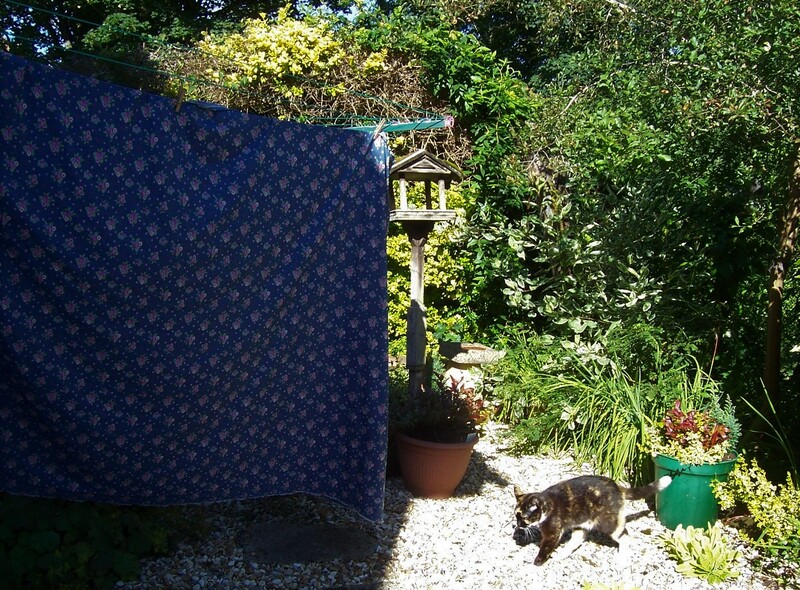 Jazz, the Inspector Cat checks out the chambray on the washing line! p.s. As I type this post, my chambray fabric is already washed and on the line to dry. 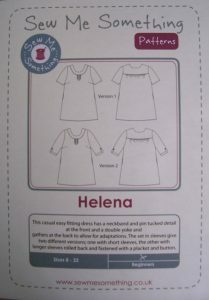 I hope to cut out the Helena dress later today – or maybe early next week. 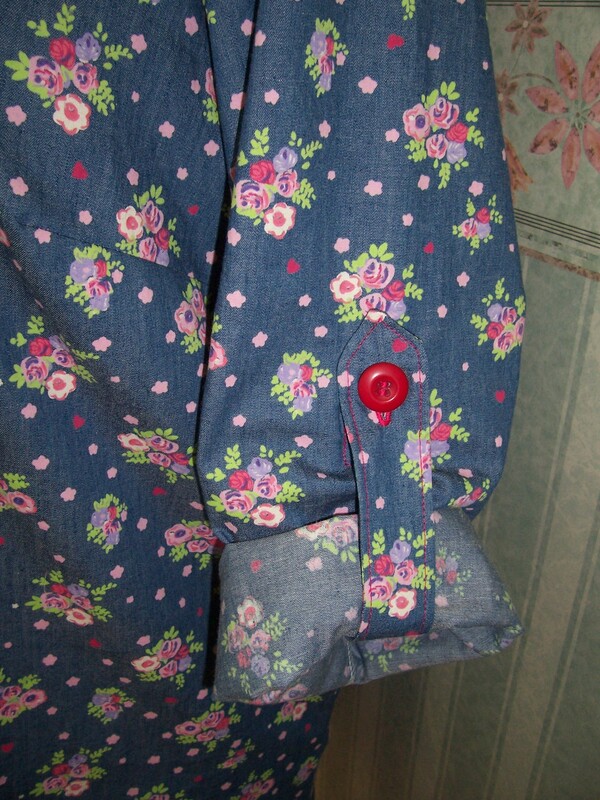 When I posted about the Kitty tunic shirt I mentioned that I had some great buttons, too many to use on a top and therefore planned to make a button thru’ dress. Well ‘fast’ is the word and ‘quick’ is the action. On Saturday a trip to Salisbury and visit to Fabricland resulted in returning with 5 metres of the vintage bird print cotton fabric and lace for trimming the underwear set. I have already posted details of the first set of underwear – but did not go on with the second set as I was too excited about making the dress! 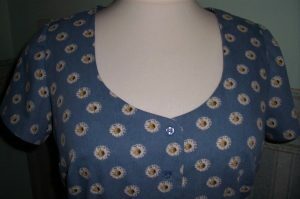 I used the bodice from the previous Kitty dress as this had already been adapted for button front and a waistline seam. This time I planned to make a midi-length gathered skirt with buttons and buttonholes through both bodice and skirt. However, as the construction developed I decided to reduce the length of the skirt. I am only 5’4” tall and by using a vintage print and the longer length it looked like I was wearing my Nana’s dress! In the end the skirt was finished at 26 inches long with a 3 inch hem. There were no problems with the construction, just the fact that there are several detailed processes, this dress has taken quite a long time to complete. 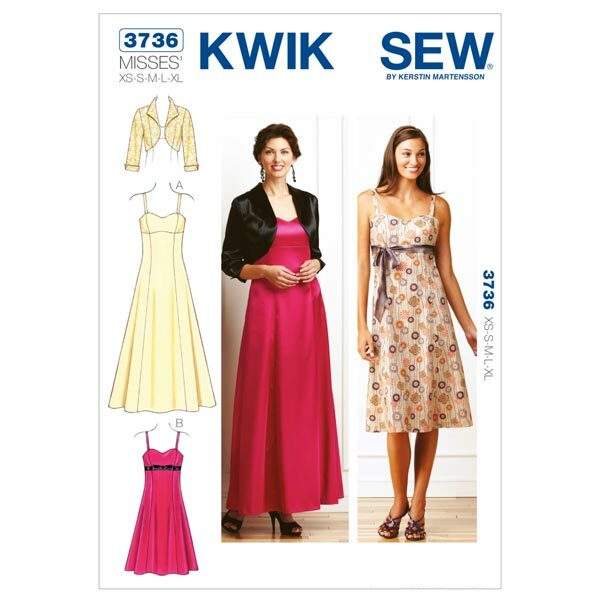 The collar and facing together with the front edges of the skirt have been interfaced with Vilene ® 22o fusible to provide plenty of support for all the buttonholes. 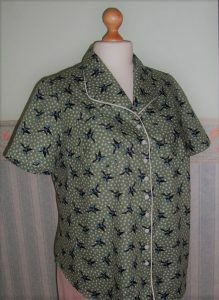 The sleeves are lined with plain White polyester cotton. I used my standard pocket pattern which includes the facility to stitch the top of the pocket into the waistline seam and thus prevent them from ‘flapping’ about inside the skirt. Having cut two panels for the skirt, I arranged for the joining seam to be at centre back. I then used another TNT method to ‘insert’ short side seams into which the pockets were added. 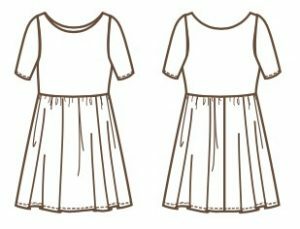 This method has the advantage of adding a little shaping to the skirt so that the top measurement is slightly less than the width at the hem. All seams have been overlocked and there are 11 buttons and buttonholes. Fortunately the one-step buttonhole setting combined with the buttonhole foot on my Brother 4000D machine make very light work of buttonholes. Again I used my new button attaching foot for the buttons. 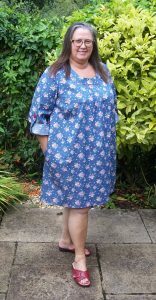 The buttons, thread and interfacing were all in my stash and the dress took just 3 metres of 114cms wide fabric which cost a total of £13.77. I am very pleased with the end result. I recall that I have some Sage Green twill fabric in my stash -I wonder if there is enough to make a little jacket to go with the dress? 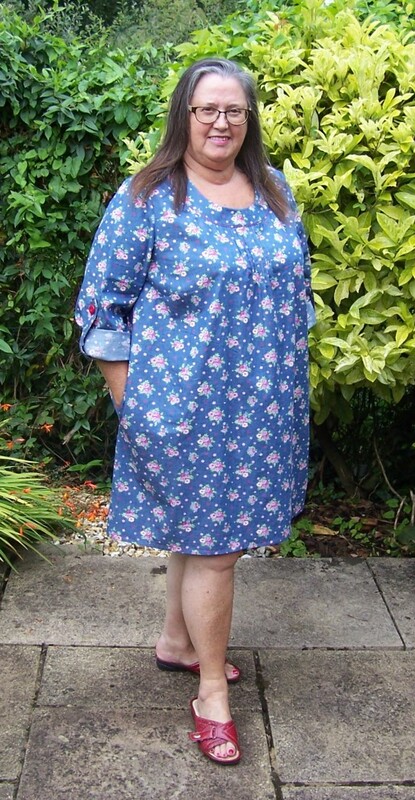 One of my August sewing plans was to re-visit the Moneta pattern by Colette patterns. I have made this pattern twice before. 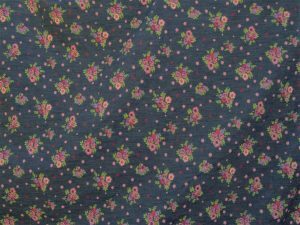 The first time using a black background floral print fabric from Fabricland which worked out fine and the second time a Flamingo print which came out too small and was sold on eBay. So – let’s hope third time lucky! Having double-checked my measurements against the size chart, I cut a 3X but then reduced to half-way between the 2X and the 3X. I used 2 metres of a multi-coloured polyester (?) jersey that I bought a couple of months ago when I visited Goldhawk Road. I love the print and colours of this jersey which is very stretchy but also has a ‘sanded silk’ finish – oh so soft and stroke-able. I made view 2 but added a neckband rather than a bodice lining. Due to the constraint of lack of fabric, the back skirt has a seam (although I notice there is also one on the line drawing). The construction was straightforward but the elastic for gathering the skirt pieces and the twin needle stitching on the hems leave a little to be desired – some skipped stitches which is annoying. I used my usual TNT method of applying the neck binding which has resulted in the neckline scoop being quite high, certainly higher than I would like but hey-ho it is still wearable. Because of the busyness of the pattern, this dress can be worn either way i.e. front at the front or at the back so it’s like 2 dresses for the price of 1! The style of the Moneta dress is a wardrobe staple. However, in the final analysis I think that I prefer my versions – either the Paoletta (gathered skirt) or Paoletty (circle skirt) both of which are hacks from the original Paola turtle neck sweater. As promised in my previous post -here is the Kitty tunic shirt that I made using the fabric given for my birthday. The pattern is a ‘hack’ from my Kitty shirt dress which was itself a ‘hack’ from the Kwik Sew K3736 Bolero jacket. I am certainly getting my money’s worth from that pattern and that’s even before I have a go at making up the dress included in the pattern envelope. To make the adaptations was a simple matter of extending the bodice front and back, adding a shaped hem and also lengthening the sleeves. Construction was very straightforward. To emphasise the shaping of the collar in this busy print, I added some Cream satin piping. For the front fastening I did find some fantastic buttons in my stash but as there were so many I decided not to use them on the blouse. 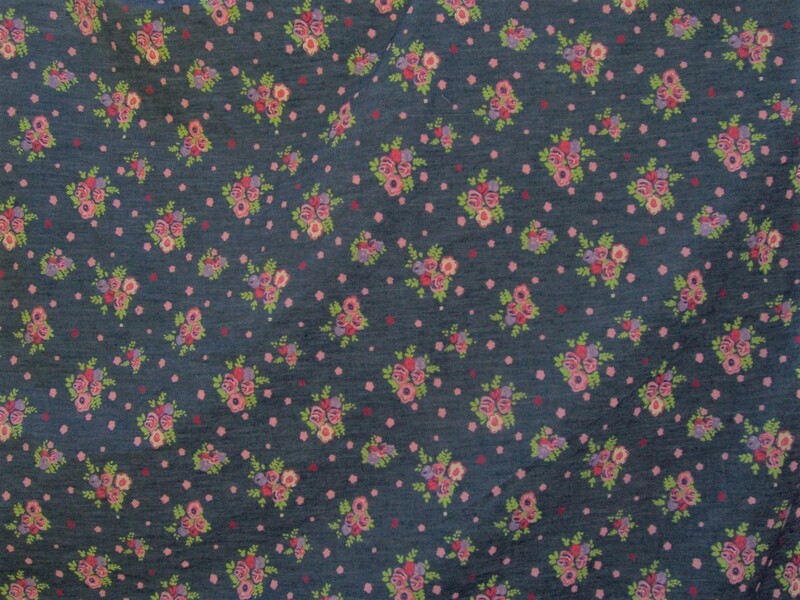 Instead I plan to buy more of this particular printed cotton to make a button thru’ dress. n.b. actual colourway is more sage than this picture shows. Finally, I used some more of the White plastic poppers (similar to those for the dog-print shirt posted in May). Because of the length of the shirt and the spacing of just 2 inches apart, there are 9 poppers which in hindsight is probably overkill, but hey ho they are installed now so no going back! So there we have it – the first of my August makes completed. Now onto the next project…. what will it be?